Located in a business precinct in Frenchs Forest, Forest Espresso serves a Monday to Friday breakfast and lunch business community. Forest Espresso has just surpassed their 25,000th order placed via the YQme app. “Having our own branded app helps us to plan and organise time better. 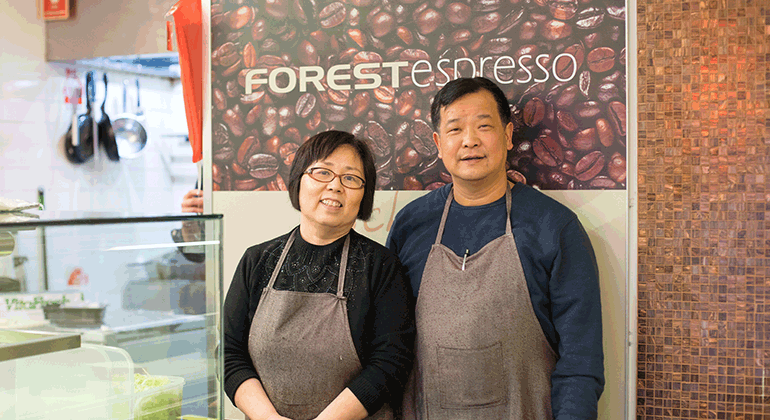 We can get prepared and manage busy periods more easily.” Victor Li, co-owner of Forest Espresso. “It saves so much time – we don’t have to take orders by phone which can take 5 minutes or more simply asking questions about the details of the customer’s order. On the app, the menu leads the customer through the choices they need to make, for example, what milk to add in their coffee or what fillings they want in their sandwiches. We can prepare their order just before they come and collect it. Customers like the convenience of no queues, they simply place their order on the app ahead of time – it’s easier, people don’t have to wait, and they just pick up and go. It is easy to promote to customers too, especially if they are waiting in the queue – we tell them about our app and suggest they download it to save time. They also enjoy that they can store favourites or simply call up recent orders to make their choice. We have found that business customers also enjoy using the app for placing catering orders and its saves us time chasing invoices as they have a YQme managed account. The menu setup is so easy on YQme, I simply log in to make any changes I need to the menu – adding new items, deleting old items. It doesn’t happen often, but if we have a situation where we are out-of-stock of an ordered item, we just ring our customer – the phone number is on the order – and discuss it with them. It is also good on the app that we can set order delay times for different times of the day, so the customer gets a confirmation straight away and knows exactly when to pick-up.